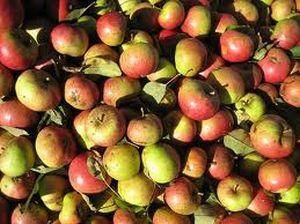 Harry Masters Jersey - Cider Apple Tree £12.75 - Cider Apples - Bittersweet Apple Trees and Fruit Trees For Sale. Buy at competitive prices with wholesale discounts. Bred by nurseryman Harry Masters of Woolston, Somerset this variety has enjoyed great popularity amongst successive generations of cider makers as a vintage quality mid to late-season bittersweet. The juice is sweet with mild tannin and makes very good cider. Harry Masters Jersey trees are generally quite compact and bushy and cropping is good and regular, though older trees might become biennial. Also known around the Glastonbury area as Port Wine.